“My dad didn’t even like doughnuts that much,” Simpsons creator Matt Groening told The Smithsonian when asked about similarities between his character Homer Simpson and his father, Homer Groening. Of course, the older Groening didn’t need The Simpsons to make a name for himself—he had already done so as an advertising man and self-taught filmmaker. Groening (rhymes with ‘raining’) was born in Saskatchewan in 1919 and grew up in Albany, Oregon. After graduating from McMinnville’s Linfield College, Groening moved to Portland to pursue a career in advertising and raise his family, some of whose names (Margaret, Lisa, Maggie) would one day famously christen the animated family created by his son within a cartoonized version of Springfield, Oregon. 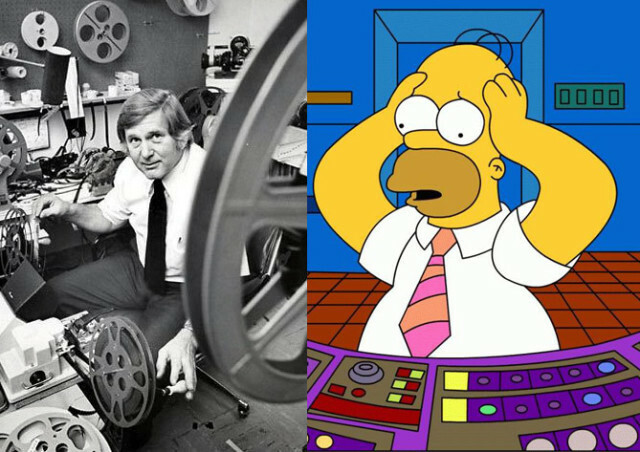 Now in partnership with the Mid Century Oregon Genius series, the Groening family will screen the first-ever retrospective of Homer Groening’s work, and Matt Groening will make a rare Portland appearance. Portland-native and two-time Oscar-nominated animator Bill Plympton, who sought out Groening's advice as an undergrad at PSU, will introduce the night, and Lisa Groening will lead a post-viewing panel including Plympton and Groening friends and colleagures Tom Shrader and Ted Mahar. You can watch a couple of Groening’s films below, and then attend to get as close to the “real life” Simpsons as one possibly can (or at least their progenitors). The Story [filmed 1963, released 1969] - Features a very young Matt and Lisa Groening. Basic Brown, Basic Blue  - This satirical mash-up of the fashion and travel industries showcases an infectious, deadpan sense of humor. A Study in Wet  - One of Groening’s earlier experimental films. Look for the company logo that will reappear more than 30 years later in Matt Groening’s Futurama.